The financial landscape has changed. There is widespread concern about Social Security and employer-funded pensions have become rare. To prepare for this new vision of retirement, you need a realistic plan. Retirement Income – Carefully plan your goals and focus on personal savings and investments. Seek the assistance of a professional financial planner. Time – If retirement is close at hand, liquid investments that preserve principal may be most suitable. If retirement is years away, you may be able to include more aggressive investments. Inflation – You may need some growth-oriented investments to keep up. Historically, stocks provide superior returns over bonds and cash equivalents, but generally involve greater short-term risk. Taxes -- They will remain an important factor. Any income you earn might affect the amount of tax you pay on your Social Security benefits. 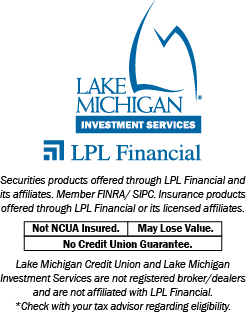 Contact LMIS by going online to lmcu.org/investments, or call (616) 234-6524 for a free, no obligation financial review of your unique situation.